Bethesda have announced a publishing deal with Titan Books to produce book series tied into Elder Scrolls Online and Skyrim. The MMO will have two books, one covering the lands of Tamriel and the other assembling the lore for players who want to know more of the game’s backstory. The Skyrim book series will collect together all the in-game books as anthologies to put on your shelf. ‘The Land’ and ‘The Lore’ will both provide a good deal of Elder Scrolls Online’s background. There’ll be a history of Tamriel, maps of the areas, and lots of new artwork and unreleased concept art from the game’s development. 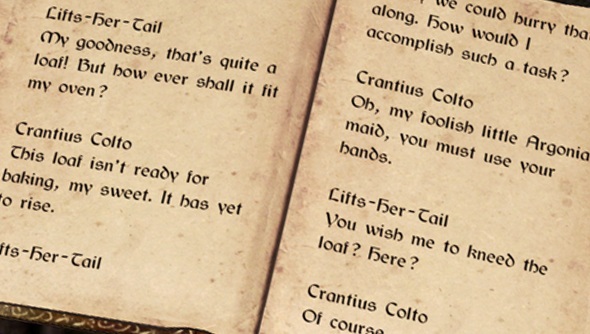 The books tied into Skyrim are a collection of three anthologies of the texts that can be found in-game. They’re split into ‘The Histories’, ‘Man, Mer and Beast’, and ‘The Arcane’. All three books will come with illustrations (which is an immediate improvement on the books in the game). The first volume of both the Skyrim and Elder Scrolls Online series is expected to have a release date in March, 2015.